Back-to-school season is a busy time of year for many Americans. For our nation’s 1.3 million service members and their families, it sometimes means enrolling the kids in a new school — for the third, fifth, or ninth time — and preparing them to walk the halls as a new kid, yet again. As I prepare for my own 2-year-old daughter, Sophia, to start preschool next week — hearing her sweet little voice say, “Bye-bye, Mama!” — I can’t help but think ahead to her elementary and secondary school years as a Navy kid. How often will our family move? Will she be able to adapt? What can we do as adults to make those transitions easier for her? Given my own lack of experience as a new kid in school, I turned for advice to two of the smartest, most resilient military kids I know: Grace and Joe. These teenage children of my dear friend and colleague Shelley have moved five times, and they consistently do the new-kid dance with style. The wisdom they offered has helped inform the initiatives, partnerships, and outreach conducted by my team at the Military Family Advisory Network, and is the basis for some sound advice for educators, parents, youth mentors, and other students as this school year begins. First, keep tabs on all the big life changes for students of military families. Frequent relocations, of course, mean the anxiety of adjusting to new schools, towns, activities, climates, and schedules. But there are also the unique stresses of a parent deploying, including when routines get thrown out of whack and responsibilities at home shift quickly. For the same reasons, the parent’s return from deployment is sometimes just as hard. If educators overlook these factors and the support they require, a student’s academic performance can slip unexpectedly. Second, pay attention to the social scene. Military kids who move a lot often deal with the social stress of walking into a lunchroom or running onto the playground without a single friend to sit or play with. When students feel insecure or anxious, they may lose focus to the point where academic performance declines. Analysis of data from the National Assessment of Educational Progress correlates weak social networks with lower grades. The reverse is also true: More social support is associated with higher grades. 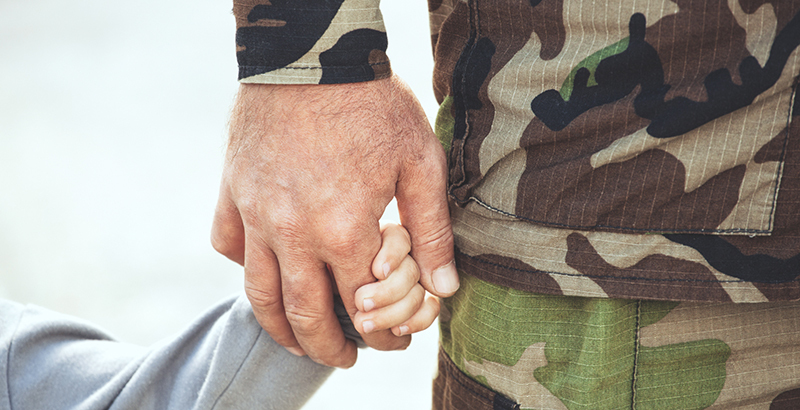 Resources are available if you’re unsure of what to say or do for new military families. There’s Military Kids Connect, the Military Child Education Coalition (especially its Student 2 Student and Parent to Parent ambassador programs), and our network’s 2017 survey report for guidance on supporting military kids through school transitions. Our network also partners with a program called the Congressional Award that helps build consistency for military kids by supporting them in a long-term service project that continues even after switching schools. While it’s true that being a new kid at school isn’t easy, kind people and thoughtful school administrators are looking out for military children around the country as they bravely step up to the challenge of a new school. And when Sophia’s time comes to hop on the big-kid school bus, I hope that our family will be prepared to embrace the uncertainty with the same confidence and resilience that I see in veteran new kids Grace and Joe. Shannon Razsadin is executive director of the Military Family Advisory Network, a nonprofit organization that connects military families with the resources they need to thrive.